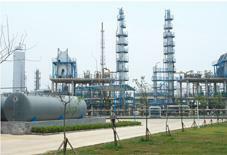 There are two main routes for Ethylene Glycol (Monoethyle Glycol/MEG) production: one is the Olefin/EO(Ethylene Oxide) Route starting from either naphtha, ethane or methanol, the licensors include Shell, SD, UCC and etc. 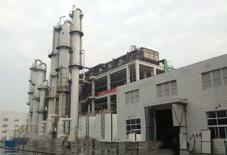 And the other is the DMO(dimethyl oxalate) Route newly emerged in China these years, starting from syngas. Depending upon the difference operation pressure, this DMO Route is further divided into Normal Pressure Process and Medium-High Pressure Process. SL TECH offers the most advanced and the most competitive Medium-High Pressure DMO Process for MEG production. Its production cost is much lower than that of Olefin/EO Process at the current low oil price (i.e., USD 67/ BBT), not to mention the Normal Pressure DMO Route. 1. The pressure of the carbonylation unit is increased to 2.0-3.0MPa, about 5-7 times the conventional process, thereby the diameter of main equipment and pipes are reduced by 2-2.5 times. 2. 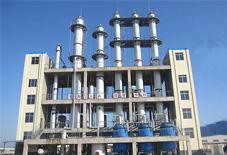 The carbonylation reactor is changed from tubular type to plate type, whose heat transfer effect is increased by one time, the catalyst loading coefficient increased by over 60%, the STY (Space-to-Time Yield) more than doubled, which allows the large scale of each production line. 4. The CAPEX of the carbonylation unit is reduced by 50%, while the investment of the carbonylation unit takes 40% of the total investment.